An important project for Hotel Sheraton Annaba, Algeria, has generated a lot of information, difficult to compile in a short text, and we have therefore divided it into two different publications: firstly the spherical dome, and secondly all the finishes inside the building created with the Solid Surface from PORCELANOSA Group, KRION®. The Fabris&Partners architecture studio was in charge of designing the spherical dome, inspired by the rigid shell of the sea urchin, attached to the main building. For this work, KRION® was selected as the construction material due to its versatility and the multitude of properties which make it ideal for exterior coverings. 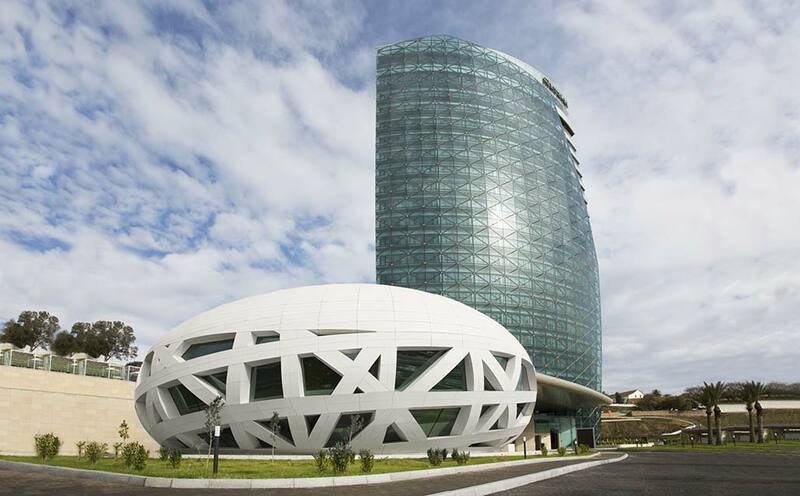 Initially, work began on a symmetrical spherical body without openings on the exterior, which then had to be altered to achieve perfect harmony with the main tower ofHotel Sheraton Annaba. In this way, the outer dome was made with a circular plane and symmetrical in three dimensions. The next step was to attach it to the canopy of the hotel, which required making it asymmetrical. Finally, the internal part had to be developed; to do so the architect decided to make openings to the exterior, following the path of the predominant ramp in the internal structure. One of the difficulties which arose for the Fabris&Partners studio was to find a material which would allow the final form to be achieved. Ultimately, KRION® was selected, all pieces being specially curved and cut, and thanks to the technical office of Butech, the design could be adapted to the K-Fix anchoring system. The structure is 1,800m2, made from KRION® 6502 Pearl.